Portion Sizes are Out of Control! Portion Sizes are Out of Control! Portion Sizes are Out of Control! Are Bigger Meals Bloating Your Waistline? With the New Year comes another round of New Year’s resolutions, most of which revolve around weight loss and wanting to lose 10, 20, 50 or more pounds. A stringent plan of attack may even be put into place to go to the health club four times of week, eat healthy and meet that goal. Unfortunately, many will fail. Most Americans who say they want to lose weight are not seriously trying. The problem is that there is a big difference between wanting to lose the extra weight and actually following through and doing something about it. These findings were confirmed in a recent Gallup Poll, which revealed that most Americans -- 55 percent -- say they would like to lose weight. However, less than half of those people (27 percent) are making a serious attempt to lose the weight. There also seems to be a misconception of what is considered overweight, as 36 percent of Americans in the study considered themselves to be in the overweight range, but when the Poll compared the self-report information to their reported ideal weight, the number of overweight people jumped to 62 percent. According to Gallup, obesity rates are exceeding 30 percent in several states and a rising number of Americans are being diagnosed with diabetes, a health condition commonly linked to obesity. Fad diets are ineffective because of their tendency to place a severe restriction on calorie consumption or on certain types of food. Studies have shown time and again that people who do extreme dieting typically regain the weight they lost, along with a few additional pounds on top! 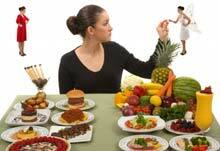 Rather, the key to weight loss is using portion control, daily exercise and eating a wide variety of healthy foods. Severe restriction of foods, on the other hand, makes you want them more and there’s a great chance you will eventually give in to the temptation -- and possibly engage in binge eating when you allow yourself the “forbidden” foods. However, it can be tricky to figure out what an appropriate portion size would be, especially since portion sizes in North America have grown significantly over the past 30 years. If you need a quick frame of reference for the amount of food you should be eating all you need to do is take a look at your hand. You can use the palm of your hand to determine the correct portion for certain foods like meat. For example, 4 ounces of cooked meat = palm of your hand. Of course, don’t forget to factor in individual differences such as your level of activity, height, age and muscle mass, which may increase or decrease the ideal portion size for you. There are several tricks and techniques for eating the portion size that’s right for you. You can start by going through your kitchen cabinets and assessing your dinnerware and serving sets for sizes and even changing the ambiance of your dining room. Plates: By eating off of smaller plates, such as 6-inch in diameter saucer-sized plates, you will trick yourself into thinking you’re eating more than you actually are. Bowls: Use your small bowls for foods you tend to eat quickly, like cereal and ice cream, and keep the big bowls on reserve for foods you tend to eat more deliberately like salads and stews. This technique will allow you to fill up quicker on fewer calories and healthier foods. Glasses: Use tall glasses to trick your mind into thinking that you are getting more liquid. Research shows because your brain focuses more on height than width, adults pour about 19 percent more liquid into short, wide glasses than tall glasses. Spoons: Forgo your tablespoons and replace them with teaspoons to serve the food onto your plate. Studies have found that people will scoop out nearly 15 percent more food with a three-ounce serving spoon than when using a two-ounce spoon. Serving dishes: Choose ceramic over glass serving dishes. One study showed that women ate 71 percent more food out of clear dishes than solid-colored ceramic dishes. Also, use half-gallon serving bowls instead of one-gallon bowls. Studies have shown that people ate nearly 56 percent more foods when they helped themselves from a one-gallon bowl. Candles: Blow out the candles just before you start eating dinner. Experts found that dim lighting causes people to extend mealtime and end up overeating. Walls: Paint them blue as it is supposed to act as a natural appetite suppressant. Contrary to warm and inviting colors that make you want to eat, blue shades tend to make food appear less appetizing, causing you to eat less. Eating slowly and thoughtfully will help you to avoid overeating and enjoy your food. Don't overload your plate or table with food: Start by taking small amounts of food from your plate and remind yourself that if you are still hungry after you’re finished, you can always go back to get more. Cut your portion sizes in half: If your daily lunch is a huge sandwich, try cutting it in half, eating one half and waiting a few minutes. This will give your body time to receive a full sensation. You may even decide you’re not hungry enough to eat the other half. Slow down: Eat slowly to avoid overeating. The process of your brain signaling to your stomach that you’re full takes about 20 minutes. Start cleaning: Once you finish eating your meal, get up and start clearing the table and washing the dishes immediately. This way you won’t be tempted to get up to go for second helpings. Eat several small meals each day: Instead of eating three big meals, try eating five small ones a day. Eating smaller meals allow your body to metabolize the meals quicker to burn more calories and lose weight. Switch over to a fresh, whole food diet: Healthy eating is a great opportunity to expand your horizons and open yourself to a variety of new foods, adding excitement to your daily food plan. This also means altering your diet to be mainly fresh, whole foods, rather than processed varieties. When preparing meals with locally grown ingredients from a source you trust, these are among some of the healthiest meals you can eat. Start a daily exercise program: One of your best lines of defense to keeping weight off is staying active and establishing a regular exercise routine. But because your body and mind are so closely linked, a weight loss program that only focuses on your physical being will miss out on the incredibly important mental and emotional aspects of health. Sometimes the body needs extra support to burn fat. Using key nutrients to reduce cravings, improve metabolism, and support hormone balancing may promote faster and more efficient weight loss. Because fiber slows down digestion, it can produce a sense of fullness causing you to feel satisfied quicker and longer. It takes energy, specifically cellular energy, to burn fat and lose weight. If the mitochondria, the powerhouses of the cells, are damaged due to age or lack of antioxidant protection, they become starved for energy and can not function well enough to burn fat. If you're looking to achieve long-term health improvements, behavioral changes and self-acceptance are more effective than dieting any day of the week, according to a two-year study published in the Journal of the American Dietetic Association. This is why you will want to include a form of physical activity and daily exercise routine to gain physical, mental and emotional benefits of living a health good quality life. And remember, losing weight is not about dieting or restrictions … it’s about changing the way you think about food, ensuring good nutrition support and a healthy lifestyle in general. The first step to doing this is to become aware of your eating patterns; for instance if you tend to overeat when you're stressed about work, make adjustments based on them. If you know you tend to overeat when you're overwhelmed, make it a point to keep yourself busy with another activity (even something relaxing like reading or taking a bath) during this time. When eating out with your spouse or significant other, or even a friend, consider ordering and sharing one salad and main course, and passing on sweets. It will cost you half the weight and half the cost. It will also send a good message to restaurants, of which nearly all are counting on making more money by “supersizing” portions instead of offering healthy “smart-size” portions. Watch this video for more insights on how and why restaurants’ portions and their marketing have moved to “over-serving” to increase sales and profits! By adding just one or two consistent healthy behaviors to your routine each day, you’re subtly changing your old, weight-sabotaging habits into new healthier ones.